Each year, annual benefits enrollment gives Emory University faculty and staff the opportunity to review their benefits and make changes for the upcoming year. Surprisingly, only about 50 percent of university employees actively participate in annual enrollment. While fall is always a busy time at Emory, it’s still important to look at your benefits and make sure you have what you need for the year ahead. 1. Set aside money for your Flexible Spending Account. Paying for your medical or childcare costs is easier and cheaper when it’s pre-tax. You can contribute from $200 to $2,600 to a Health Care FSA and up to $5,000 to a Dependent Day Care FSA. Remember that your FSA selections do not automatically roll over each year; the IRS requires that you decide how much to set aside annually. 2. Review your costs. Spend some time looking at what you spent on health care costs this year. Aetna’s Plan Selection and Cost Estimator tool can help you take a look at your claims data from the last 12 months. 3. Increase your life insurance. During annual enrollment, you can increase your supplemental life insurance by up to $20,000 and your spouse’s by $10,000 without providing Evidence of Insurability (EOI). It’s quick and easy and provides more financial protection for you and your family. 4. Check your beneficiaries. While completing your enrollment in Self-Service, it only takes a few minutes to check and make sure you have the right people listed as your beneficiaries on your life insurance. 5. Consider adding Short Term Disability coverage. While Emory automatically provides coverage for Long Term Disability, there is a 180-day elimination period before you can receive funds. Short Term Disability (STD), with very affordable rates, provides a benefit equal to 60 percent of your base salary for a period of 180 days and you can select from waiting periods of 15, 21, 30 or 60 days. If you are not currently enrolled in STD, consider adding it (note: STD is available to staff and post-docs only). 6. Increase your retirement contribution. Since there are no rate increases for the medical plan this year, now is a great time to increase your retirement contributions. Although you can do this at any time throughout the year, annual enrollment is a good time, too! 7. Make sure your address is up to date. Don’t miss out on important mailings like benefits information or your W-2 statement. In Self-Service, you can check your address, phone number and other personal information to make sure everything is correct. With the new PeopleSoft upgrade, you can now also change your information as it appears in the Emory Directory. 8. Get your remaining incentives for 2017. You have until Nov. 15 to complete your 2017 incentives, which will help you save on medical costs. 9. Invest in your health. Living your healthiest is the best way you can help keep your medical costs down. Make your appointments for your routine preventive care like your annual physical, mammogram or colonoscopy. And, remember that preventive care is free with your medical plan. 10. Actively enroll. Don’t be one of the 50 percent who lets enrollment pass them by this year. Log on to Self-Service/PeopleSoft and get started! Don’t wait too long — Emory’s annual enrollment period will close on Monday, Nov. 6. These are just a few things you can do during this year’s annual enrollment. There are also other many other benefit programs to review as well. 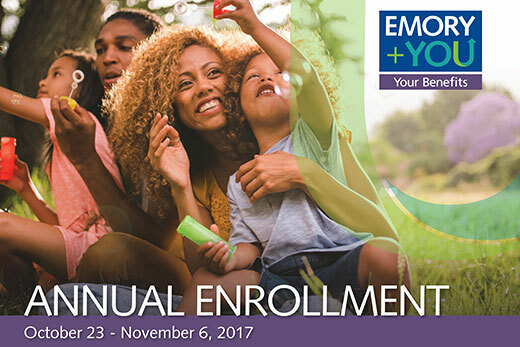 For more information about your benefits options for 2018 and how to enroll, visit the annual enrollment website.